We like to use glass mason jars for our beverages. One, because I don’t use plastic, and two, we have a lot of them, and three, if the kids accidentally broke one of them, it wouldn’t be as “tragic” as they are easily replaceable. The biggest issue left was the fact that they were a bit hard for the kids to drink out of. 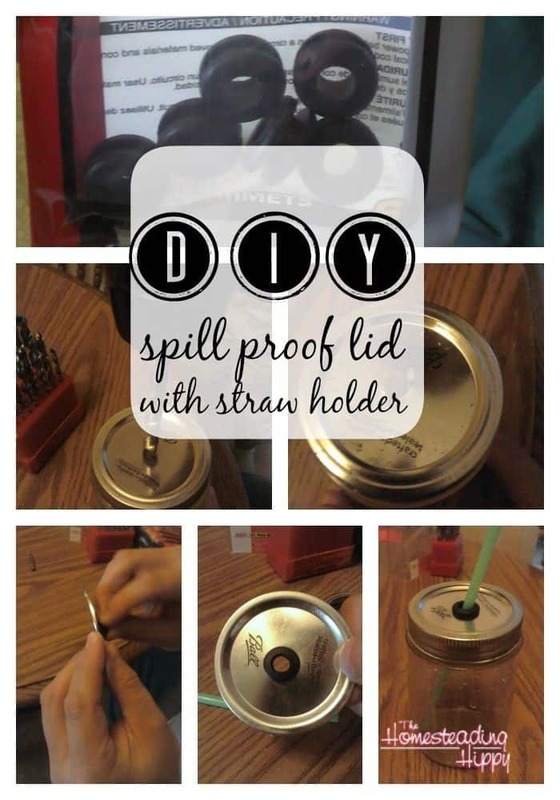 So, we set about making a spill-proof lid mason jar lid! We started by visiting Menards and going into the electrical section for the grommets. They were $.99 for the bag. Then, hubby got out his 1/2″ drill bit, and made a nice hole in the top of a mason jar lid for me, and filed down the area a bit. He inserted the rubber grommet into the hole. And, it was a tight squeeze and kinda frustrating at first, so I am glad it was him, not me. We washed it out, then placed on a clean jar. Inserted a straw, and viola! A spill proof mason jar lid is born! Those would be great for camping, too!! Pinned & Tweeted! This would work great for my son. He is constantly dumping his glass over. This is pretty practical and simple. I always wondered how these were made. Thanks! How simple! What a great idea. This is great, I just picked up several mason jars at a thrift shop. I really need to makes these… I love mason jar cups. This is neat! I shared it on reddit! I need to do this. Immediately if not sooner. Mostly for my self. I’m going to try this with the white plastic BPA free screw on lids. That’s another great idea! Let me know how that works for you! I like this but I worry about what the grommets are made of. it doubt it is food grade rubber. I guess if the liquid never touches it maybe it is ok. you can buy lids for jars made with food grade plastic. it is plastic but a lot less plastic than a cup and as much of that would touch the liquid as touches the rubber in these. Our liquid really never touches the grommets, so that wasn’t something I concerned myself with to be fully honest. I had the same thought as Swarm. Even if the liquid want touching the grommet, I would think the rubber would offgass. Does it smell like it is at all? Thanks! I honestly haven’t noticed any off gas smell…and neither does my family. 1. Are the grommets food-safe? They may be, if they’re just rubber, but I don’t know. although you have to be careful using them with hot liquids, especially with children. Of course, you wouldn’t want to use a plastic straw with hot liquids, either. The lids were the new ones…but I am not sure about the BPA in them to be fully honest. We only use those for cold beverages, so I am personally not to concerned about it. It’s far better for us than drinking water out of a plastic bottle at taekwondo or at the park. We did use plastic straws in the photo, but have since gotten rid of them and use only stainless steel straws. and again, we only use these lids for cold beverages. I’m just wondering about using plastic straws. Firstly, its a plastic hence oil is used to produce it. I recognize a straw is only a small item but I want to cut down on my use of plastic. Lastly, I don’t like to use any kind of plastic because of possible leakage when I use it. Have you seen another alternative like bamboo? for straws, the best alternative is stainless steel. I used plastic at first and in the picture but we also like the steel ones. I love this idea. I always prefer a home made fix. This is great. Wondering if you get any rust? I punched a hole in a lid, no grommet (slosh proof, not spill proof) but it rusted after a few uses. I also recently purchased the plastic lids that said they were for mason jars. Well they don’t fit mason jars. They fit the jars the same company sells. I tried on both regular and wide mouth jars. They were from Walmart and I’ve seen same brand at Costco. I honestly haven’t noticed any rust, but I never thought to look under the grommets…and I have found that the ball plastic lids (ball brand) fit any mason jar. Just have to be careful of what brand you get. I would love to make these for our shop. I can’t find the rubber grommets anywhere! Where did you get yours?